This hospital, located in Seaford, DE, has grown into a full-service medical center with physician offices, specialty centers, and expanded ER and a new Cancer Care Center. As a member of the Maryland Quality Improvement Project, which compares the quality of care among 900 hospitals across the United States, Nanticoke Health Services consistently receives high ratings. 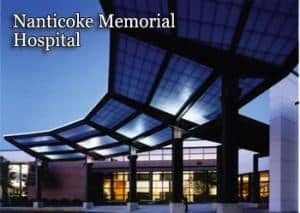 Nanticoke is recognized nationally for its accomplishments by organizations such as the American Hospital Association and The Center for Case Management. From the North: Route 1 south to exit 97 US 13 South towards Salisbury/Norfolk. Turn right onto Middleford road (at the True Blue gas station). Continue for 0.7 miles and turn left into the hospital by the helicopter pad. From the South: Route 13 north; turn left onto Middleford road (at the True Blue gas station). Continue for 0.7 miles and turn left into the hospital by the helicopter pad.